Remember when we all used to do reading challenges? Well, I guess some people still do them :D. I gave them up, but every once in a while I have a desire for some kind of themed reading that makes me momentarily pause and think of it as a challenge. Instead, they are sort of loose project ideas in my head--things I keep in mind when thinking about what I want to read. One such thing is reading classic horror stories. I don't really mean CLASSIC classic horror stories, but definitive horror stories, i.e. Rosemary's Baby which I read last year, and also The Amityville Horror which...I read last year, but am only now reviewing. Oooops. This definitely classifies as a defining horror story. It launched a many installments film franchise and is frequently referenced in other horror stories, is a basis for the way many haunted house stories go, features my favorites, the Warrens, etc. 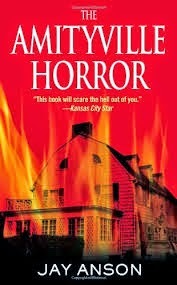 Plus when I asked for recommendations on classic horror stories to read--this was recommended to me! So alas I read it last October. I was actually fairly familiar with the story before I started to read it. I've watched some of the movies and a documentary that's on Netflix about the true story. So in some ways there were no surprises but apart from that this was an amazingly addictive compulsive read despite how ridiculous it all seems? Like, Anson really sells the horror of it and tries to make it all sound as real as possible and when an author sounds like they believe in the terror that's happening it almost doesn't matter if it flies against all common sense. But, what I found EVEN MORE interesting is how other ideas really came through even though he wasn't ~telling that particular angle of the story. Like, I mentioned that I watched the documentary on Netflix (My Amityville Horror) that seemed to suggest that George was actually abusive. One of the things that happens when they move into the new house is he starts acting like a big jerk and the book frames it as the spirits in the house affecting his behavior, etc. But it's really odd because some of the behavior is shockingly alarming and Anson just kind of...presents it matter of factly? I wonder if the year the book was published has anything to do with it, we'd be raising major alarm bells now. There's also the issue that the Lutz's just seems like people who consistently make poor choices and yet Anson frames them as being relatively normal people. Having said that, the book certainly offers up its fair share of scares. It's really fast paced--I read it during the Readathon, I believe, and reading it cover to cover really creates that rich feeling of suspense that will give you a chill down your spine! However, if you're feeling too creeped out after reading it, the internet is ready to debunk pretty much everything in the book to help you sleep at night! Thanks for the rec guys! I liked this one a lot. I purchased my own copy for reading.